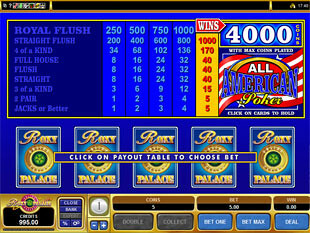 Roxy Palace Casino is a fantastic way to try your luck in online gambling, especially if you’re a video poker fan. Try over 350 games like roulette, slots, baccarat, blackjack or video poker, and you’ll enjoy their amazing gameplay and fiery graphics. No wonder: powered by Microgaming, this hot casino offers you not only these fantastic options, but also exclusive bonuses and average payouts of 95.62%. 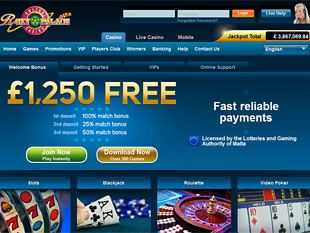 This casino is online since 2000, so now they can offer you really special promotions. The welcome offer is surprisingly big – 100% up to $1,250 Free Cash. The sum is split into six deposits of at least $20 made during you first week at Roxy Palace. Nice wagering requirement of 30x is valid for any game and any bonus you get within the welcome offer, so you’ll have no troubles with playing the bonus cash through. First time some cash is credited to your account you get 100% up to $150 Bonus. The second deposit gives you 25% up to $125. Deposits #3 and #4 award 50% up to $100 and 30% up to $125 respectively. The fifth deposit offers a special prize – 120 Free Spins up to $624 for playing Great Galaxy Grab Slots. The final deposit you make within this welcome offer awards 100% up to $101 Free Cash. If you’re a fan of slot games, you’ll be pleased to know that at Roxy Palace it is possible to get a good share of $3,000 in Free Spins. To get access to the free spins bank you need to deposit at least $100, and wager as much as possible. Every $10 wagered award 1 point in a special rank table. Logically, the higher you rank, the more cash you get in form of free spins. The sums you win range between $4 and $600, and the number of free spins – between 6 and 40. Also, Roxy palace offers you nice cashbacks. Every week from Tuesday 00:01 to Wednesday 23:59 GMT it’s possible to claim the Midweek Moneyback up to $600. The players with Regular, Silver, Gold and Platinum Loyalty Tiers receive 5% up to $20, 5% up to $100, 7.5% up to $300 and 10% up to $600 cashbacks, respectively. Every sum has to be wagered 30 times before withdrawal. 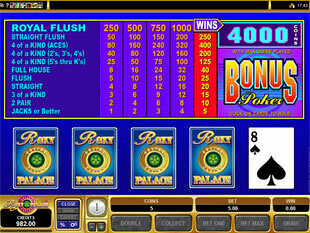 As we have already stated above, at Roxy Palace you can play over 350 games powered by Microgaming. And every their game offers premium graphics, absorbing gameplay and high pays of course. 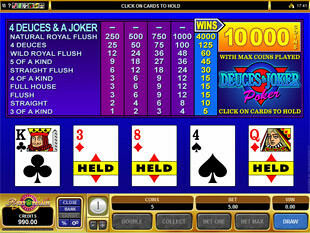 The choice of game types includes Video Pokers, Slots, Blackjack and Table Games. 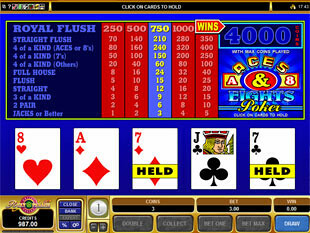 Video poker fans can enjoy round 60 games with many interesting rules and bonus options. To give you a few examples, here are the names of the most popular video pokers at Roxy Palace: All Aces, Jacks or Better, Bonus Poker, All American, Joker Poker, Deuces Wild, Aces and Eights. And this is only the short list of popular rules. 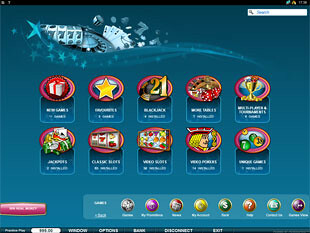 The casino also offers you special game types developed by Microgaming: Level-Up Poker, Power Poker and Reel Play Poker. At Roxy Palace you will find any payment system you can expect from a modern online casino. Deposits can be done through Visa, MasterCard, Maestro, Solo, Moneybookers/Skrill, NETELLER, ClickandBuy, Click2Pay, Entropay, UseMyBank, ECO, PaysafeCard, Ukash and Direct Bank Transfer. Fast withdrawals are available with Bank Cheques, NETELLER and Wire Transfers.